The Ministry for Primary Industries has not been ”up to the job” when it comes to dealing with the Mycoplasma bovis outbreak, Federated Farmers national board member Miles Anderson believes. Speaking at Otago Federated Farmers’ annual meeting in Balclutha yesterday, Mr Anderson said he was a ”bit disappointed” in MPI’s response. Once the outbreak was dealt with, industry needed to have a debriefing with MPI and work out how improvements could be made. ”It’s currently not acceptable the way it’s going,” he said. There were people with neighbouring properties that were infected who had not been informed, while there were other farmers who had cattle of interest to MPI who were unaware of that. Communication needed to be worked on initially, Mr Anderson said. 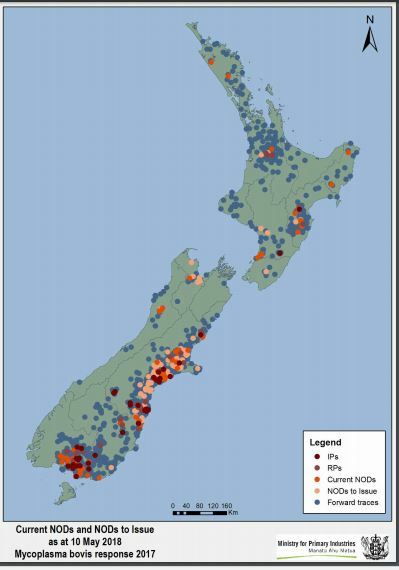 . .
Events of recent days demonstrate that eradication of Mycoplasma bovis from New Zealand is no longer a realistic option. The Ministry of Primary Industries (MPI) is scrambling to get its messaging together. New strategies are now needed. As I write this on 13 May, the MPI website still refers in its text material to 38 infected properties. But the latest version of the infection map from MPI tells a very different story (see below). It is apparent from comments by BioSecurity NZ Chief Roger Smith to a Parliamentary Committee on 10 May, that the sudden growth in infected and suspected infected properties has come as a big surprise. That may well be so to the Wellington officials, but it will be much less of a surprise to those who have been working closer to the cows. . . There is consensus from every-one, except perhaps MPI, is that the mycoplasma bovis has bolted and probably had some time ago. This whole episode has been hampered by things not working as well as they should have. Somehow the disease got in when it shouldn’t have been able. NAIT was shown to be very deficient from farmers using it through to MPI administrating it. The testing processes despite earlier assurances still appears not to be able to provide the accuracy required to be able to make decision that affect whole families lives and livelihoods. . . High-tech surveillance equipment and two tracking dogs have been called in after a wallaby was spotted in South Hokianga. Staff from Northland Regional Council and the Department of Conservation (DOC) and Te Roroa iwi members are scouring about 500 hectares of farmland and native bush. Council biosecurity manager Kane McElrea said a person had seen a wallaby on at least two separate occasions at their Waimamaku property in recent months, but did not initially appreciate the potential significance of the sightings. . .
Matamata farmers Edward (Wynn) and Tracy Brown are the inaugural winners of the Fonterra Farm Source Responsible Dairying Award. The award was presented at the NZ Dairy Industry Awards (NZDIA) in Invercargill last Saturday. The Browns are considered leaders within the dairy industry, in all areas of sustainability, business and farm management, as well as in the way they give back to the industry and community. . . The former registered land valuers are 50:50 sharemilkers for the Pouto Topu A Trust. The 460ha property on the Pouto Peninsula,at the northern head of Kaipara Harbour, milks 1020 cows. The Duncans finished top in three of the nine judging categories, winning the PrimaryITO Interview Award, Ravensdown Pasture Performance Award and Westpac Business Performance Award at the awards night in Invercargill. . .
Mr Clark said benefits allowances covered things such as boarding school fees, while reimbursement allowances were given for things such as wet weather gear and dogs. . .